Movie Heroes is excited to unleash the first trailer for Matthew Sconce's Altar. A group of old friends take a trip down memory lane in the Sierra Nevadas which ends in a bloody fight for survival. Sconce (Stricken) directed from a script he penned. Stefanie Estes, Jesse Parr, Brittany Falardeau, Deep Rai, Ancilla deValmont and Tim Parrish star as the unfortunate group of former classmates. "Directing Altar was a journey like no other I have experienced. I desired to make a scary movie where audiences would be kept guessing, care whether the characters lived or died, and recommend others see the movie. Packed with the best actors I have ever directed, thrills, chills, and twists, it turned out better than I ever imagined," Sconce shared. 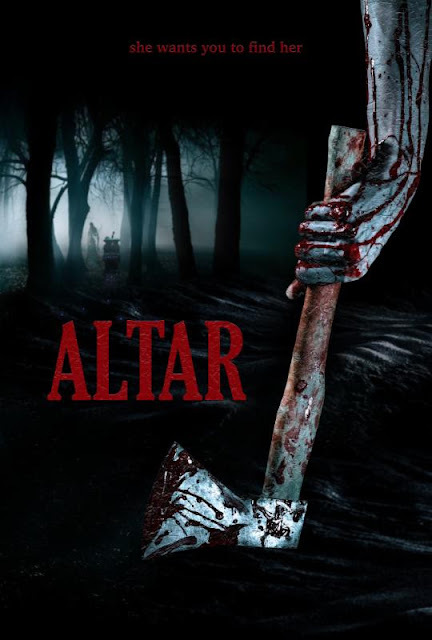 Altar is the terrifying story of a group of college classmates who get lost driving to a reunion campout in the Sierra Nevada mountains. After stopping for the night, they stumble onto something darker and must escape the evil they've unleashed. Not only are their lives in danger, but their immortal souls as well.